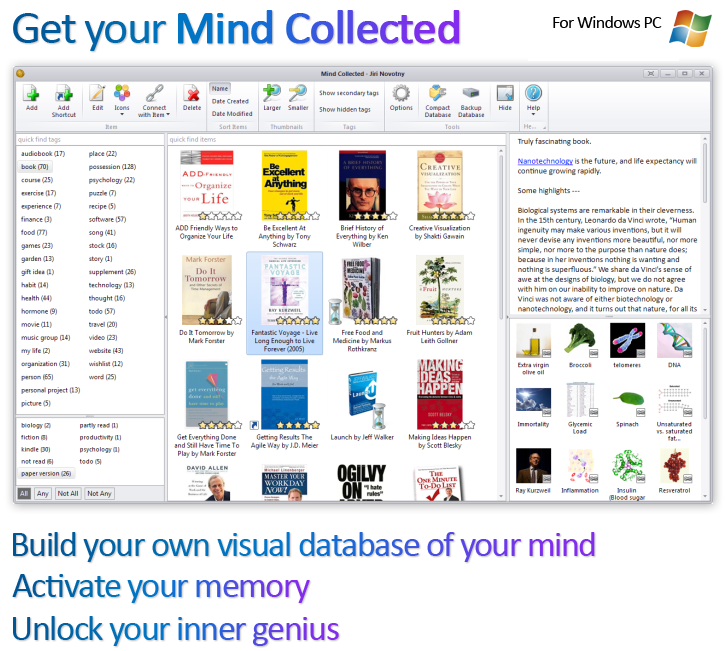 Mind Collected is a Windows software. It’s a personal visual knowledge base that you can use to change your life. Every entry in your Mind Collected database can represent anything – a goal, habit, idea, action, or real-life things such as books, possessions, investments or people. Every entry has a picture (which can be auto-found on the Internet), tags, rich notes, and links to other entries. Visualize and track your habits and goals: Visually catalog your goals and desired habits. By seeing them, you will make them more “real” for your brain and easier to achieve. You can also add overlay icons to visually track your progress. In the notes section of each item, you can expand your thoughts and feelings or log your progress (write a mini-journal). Change your thoughts and behavior by priming yourself: Simply visually catalog things, ideas, actions and goals that you would like to move towards to in your life. This will make them “psychoactive” in your brain. By visually cataloging and connecting ideas, habits or goals, you are more likely to act accordingly. For example, entering a specific healthy food into your visual database will make you more likely to buy, order and eat it in the future (as it will be “psychoactive” in your brain). Every time your brain sees a particular message or a picture, it reinforces the corresponding neurons and synapses. Such input influences your brain to steer you to think and behave more congruently with that message. This process is also called priming in psychology. The best part is that you can keep reviewing your Mind Collected entries with zero effort, which makes this effect stronger and more permanent! Because items in Mind Collected are connected using links and tags, once you start using Mind Collected as your personal visual knowledge base and use it on a regular basis, you will just incidentally keep seeing your existing entries. One nice side-benefit is that you will always have something fascinating and impressive to say to others, and avoid awkward silences in social situations. Fascinating information you’ve input into Mind Collected before will be psychoactive in your brain, ready to be shared with others. Instant vision boards: Tag items in your visual database to instantly create visual collections. When you then view any of your tags, you will immediately see a beautiful gallery. All tags in Mind Collected also act as a vision board! Vision boards can give you a boost of positive emotions and motivate you to push towards your desires in life. There is a great power in seeing positive, important things that matter to you every day. Don’t add trivialities and mundane things into Mind Collected, put in what excites you – input your future, your vision! As the saying goes, a man has never done anything that he didn’t see in his mind first. Improve your memory, learning skills and creativity: By visually cataloging things that are important to you, and inter-connecting them, you will create new mental associations. As a result, your brain will grow new synapses and neurons. Visualized information is easier to remember. Information associated to other information is also easier to remember. 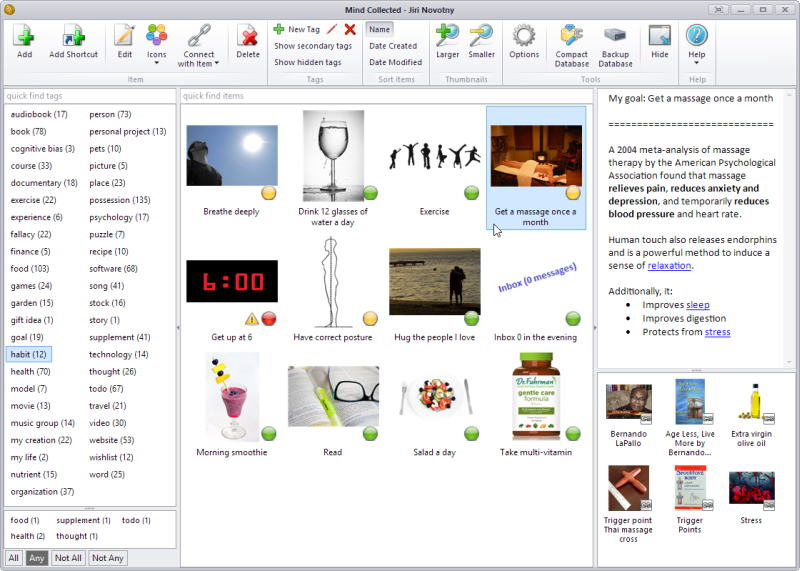 Mind Collected is very powerful in this regard, as everything you input has a picture (is visual), and is connected to other items using the assigned tags and also using links to other items that you create. The more items you input into your Mind Collected database, the stronger your neural net in your brain becomes, and the easier it is for your brain to remember, think and learn anything related. It’s then easier to take action, too! Follow your inspiration and download the free, fully functional 30-day trial of Mind Collected, and just start adding items, with pictures and tags. Just see what happens next!